Log and Raw Don’t have highlight a highlight roll off. This just keeps coming up over and over. Almost all log gamma curves and the majority of raw recording formats don’t have a highlight roll-off. Any roll off that you might see is probably in the LUT’s that you are using. The whole point of log and raw is to capture as much information about the scene that you are shooing as you can. 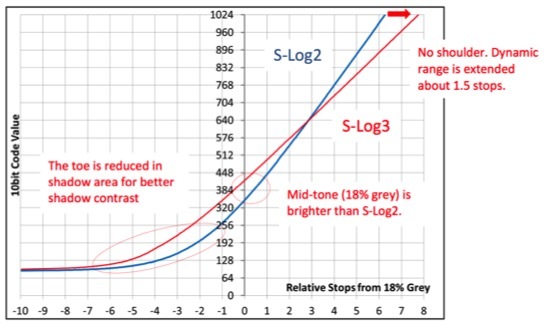 Log normally achieves this by recording every stop above middle grey with a constant amount of data, so even the very brightest stop has the same amount of recording data as the ones below it – there is no roll off. In conventional limited range recordings such as Rec-709, hypergamma, cinegamma etc, highlight roll-offs work by reducing the contrast in the highlights to make the amount of data needed to record the very brightest stops much smaller than used for the rest of the image. This allows 2 or 3 stops to be squeezed into a very small recording range, keeping most of the recording data available for a nice bright high contrast image. The reduction in contrast in the extreme highlights helps hide any highlight handling problems and makes it appear as though the sensors clipping point is reach in a more pleasing soft manner. But you don’t want this in a log or raw recording as it makes grading much harder as the footage will contain different contrast ranges, each needing it’s own grading adjustments. Also by reducing contrast in the highlights you are reducing the data. It would be very difficult to un-pick a highlight roll off and if you did want to expand the data back out you will get issues such as banding. Chart showing S-Log2 and S-Log3 plotted against f-stops and code values. Note how little data there is for each of the darker stops, the best data is above middle grey and there is no highlight roll-off. Note that current sensor only go to +6 stops over middle grey so S-Log2 and S-Log record to different peak levels. S-Log2 and S-Log3 like almost all log gammas have no highlight roll-off. The only roll off is from middle grey and down. So if you underexpose you will start to roll away the data in your scenes mid range and that’s not good. Expose for the mid range, this is the most important part of any image. If your highlights are a bit clipped don’t worry about this too much. In post production you can add a roll off in the grade that will make any clipped highlights roll away gently. Adding a bit of highlight diffusion in post will also nicely mask any clipped highlights and make them look natural.